Do you want an instrument that you can build by yourself then play? 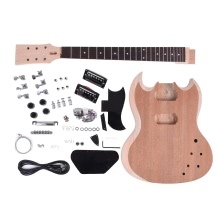 If yes, you shouldn&apos;t miss this unfinished electric guitar kit, which will let you enjoy the fun of DIY and wonderful music. Mahogany body and neck, rosewood fingerboard. Mahogany body has nice surface, easy to paint and DIY. 3-way selector switch, 2 dual-coil pickups, 2 volume and 2 tone controls. Nickel alloy string to come with a nice sound.